Note: KK from Russian Revels and I (Agirlhastoeat) attended a bloggers dinner at Cha Chaan Teng together. This is a guest blog post written predominantly by KK, with input from myself. Meet Jeremy Pang, the man behind School of Wok, a British Chinese guy with generations before him who have cooked and worked in Chinese restaurants. Chinese cookery is in his blood, and having opened his own Chinese cookery school, he is now also the consultant chef of Cha Chaan Teng, an unashamedly ‘inauthentic playful’ take on the popular Hong Kong tea houses (cha chaan teng translates literally as ‘tea restaurant’) which began springing up in Hong Kong in the 1950s. Effectively ‘Chinese-style Western food’ (and not Westernised Chinese food), they are a Hong Kong institution in themselves, serving a form of fast food that where diners can eat quickly and leave. Given its popularity in Hong Kong, surprisingly, this is the first ‘cha chaan teng’ of its kind in London. Housed discretely in the basement of the never-quite-upcoming Holborn, Cha Chaan Teng is a glitzy affair, combining the comforts of booth seating with glamour of the huge mirrored bar and white lanterns. Style-wise, it is a far cry from the cha chaan tengs you get in Hong Kong. You’re not just going to be drinking tea here, darling! Already in the second week of opening, there was a buzz with an eclectic mix of people in crowd. What a great start to a new restaurant opening. 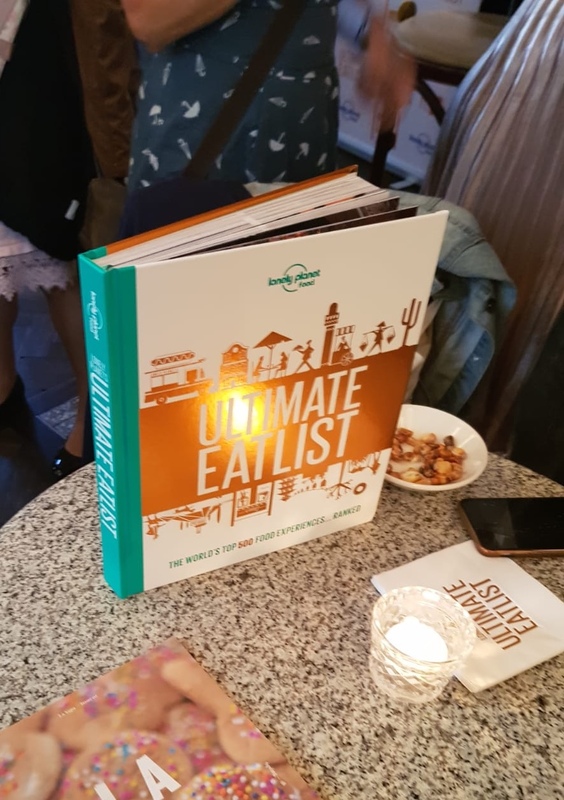 We attended a bloggers dinner, dining on a banquet chosen by Jeremy himself, around a tall round table with two lazy susans in the middle (which were a bit too lazy as they almost didn’t move too well!) Generosity and sharing are part of a traditional Chinese meal, no matter how far the recipes have travelled. There’s a huge disclaimer on the menu that the menu at Cha Chaan Teng isn’t intended to be authentic (whatever authentic ‘Chinese-style Western food’ is), and so we tried not to compare to the food might have tasted like in Hong Kong. Even so, it was fun to think back to Agirlhastoeat’s childhood years spent back in Hong Kong when she use to eat in a cha chaan teng as a child. However nostalgia can play a part in defining one’s connectedness to the food eaten. As for the menu itself, it draws inspiration from some classic cha chaan teng staples such as French toast and macaroni soup, as well as a smattering of other Chinese dishes. Before we began stuffing our faces, Jeremy gathered us up to show how bao buns, the steamed rice buns that have been so trendy in London lately, are made. We prodded, sniffed and stretched the brilliant white dough, to get the feel for this all-important base food. Special, super fine, flour is often used (often bleached back in Hong Kong, a technique which is banned in the UK). Jeremy’s team had spent weeks perfecting that one skill of making bao. In themselves the buns are rather bland, all the better for carrying fillings with strong flavours. We were ‘allowed’ to choose our little appetizers, either bao or a crusty roll. 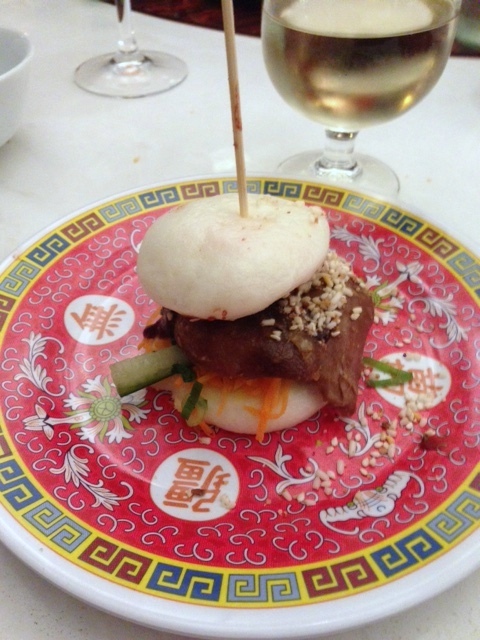 Our duck bao with hoisin sauce, cucumber and carrot pickle (£5.50) was a lovely mini manifestation of the classic high street staple of crispy duck. It was a good flavour, if a bit too dry. Benito’s Hat Farrington is the perfect place to let loose with some Margaritas and Burritos with friends after work. 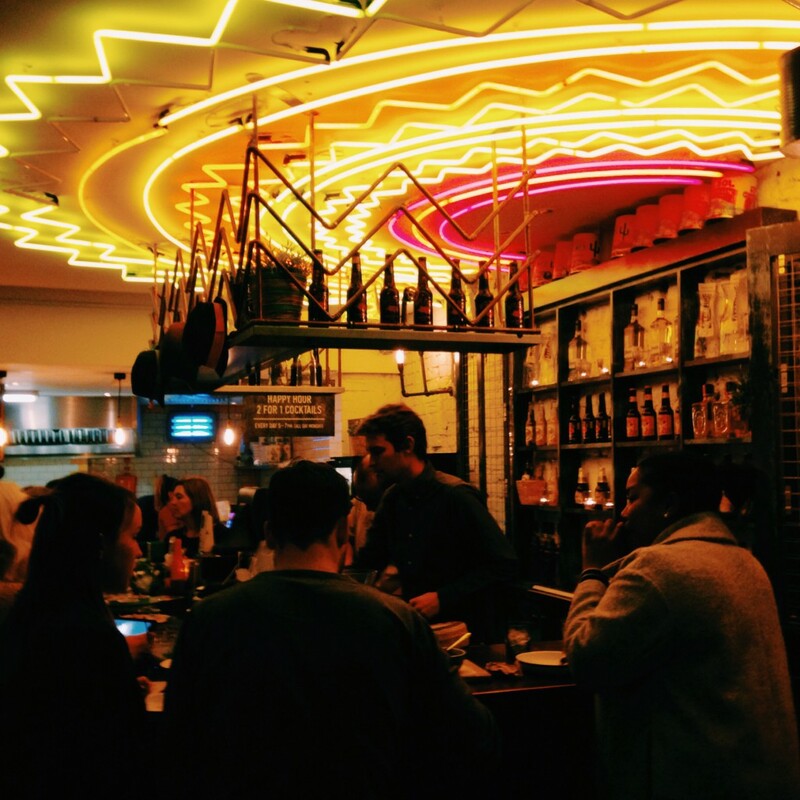 It was therefore no surprise that the bar was full, busy and bustling, with an amazing neon Mexican hat display at its entrance. 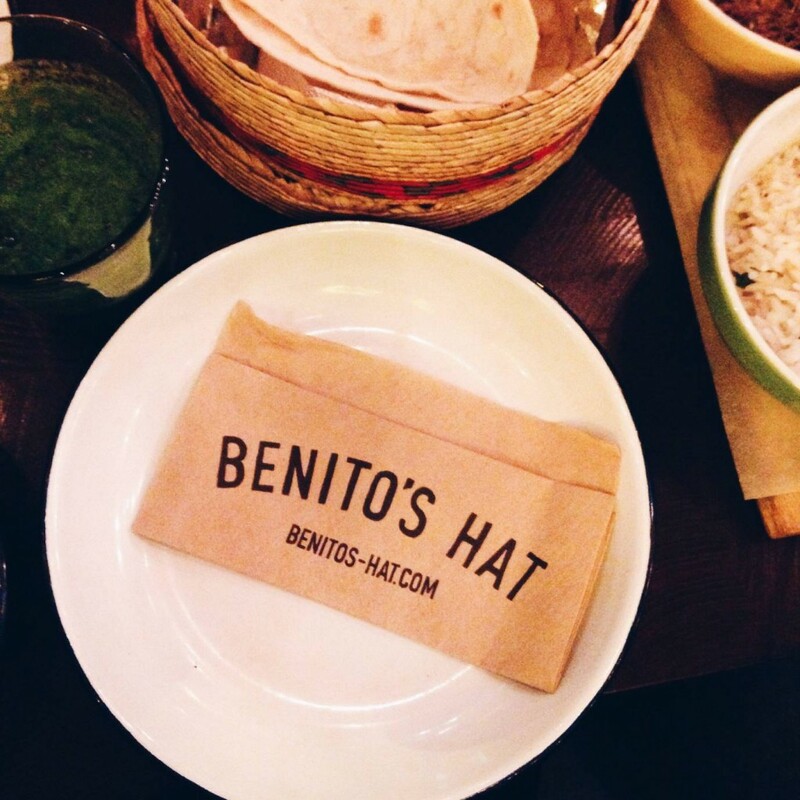 Benito’s Hat is a chain restaurant with restaurants throughout London, and it does a good job of providing a funky, cool vibe. Jose Pizarro Broadgate is Jose Pizarro’s third restaurant and follows in the footsteps of Jose and Pizarro. Both on Bermondsey Street, these two restaurants will go down as two of the best Spanish tapas places that I have ever eaten at in London. Jose Pizarro trained at the award–winning Meson de Doña Filo in Madrid before coming to London. He co-founded the Brindisa chain of restaurants before branching out on his own and opening his flagship restaurant Jose in 2011. 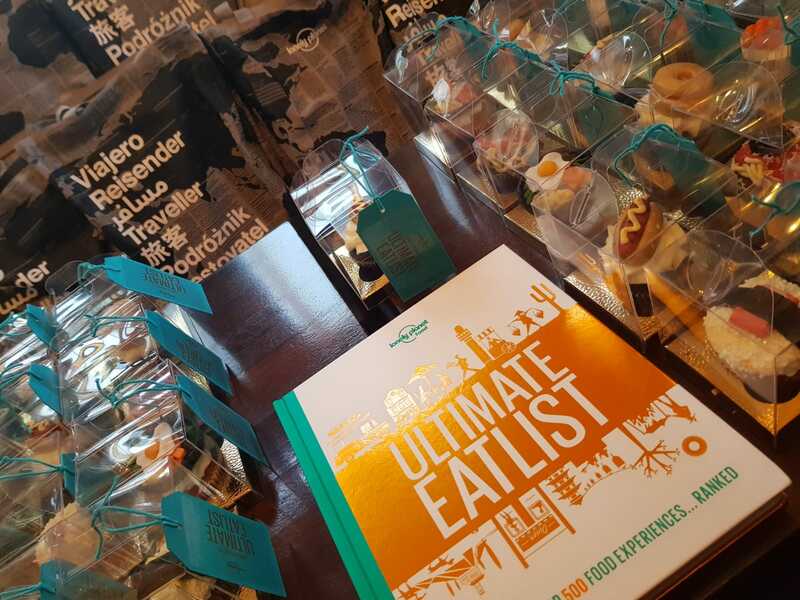 Eating at Jose was an enlightening experience for me and it showed that traditional tapas recipes could be elevated to something exquisite with the best products, great skill and lots of love and care. Pizarro was also another great dining experience, although Jose will always win hands down on the coziness front. Jose Pizarro Broadgate is a smart, corporate affair located in the newly developed Broadgate Circle at Liverpool Street. It’s a pretty slick set up and would suit the city lunchtime crowd well. We went on a Saturday night, enjoying the 50% off offer available through Opentable. 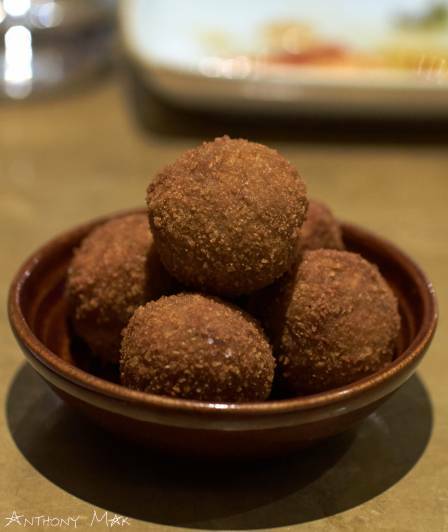 We began our meal with some classics including the croquetas ‘caseras’ (£6.50) which were tasty and filled with a warming, creamy béchamel and little bits of Portobello mushroom. The filling was nicely done, but the crumb coating was very dark and a bit hard, and it was evident the croquetas were slightly burnt. Named after the Caribbean word for barbecue, Barbecoa by Jamie Oliver is a barbecue steakhouse to satisfy even the most diehard of meat lovers. Founded by both Jamie Oliver and award-winning American barbecue chef and author Adam Perry Lang, Barbecoa boasts of luscious cuts of beef, roasts, pulled pork, ribs, smoked beer-can chicken, but to name a few. The menu is then rounded off by a plentiful assortment of starters, sides and desserts. The meat is prepared using a variety of modern barbecue methods – Texas pit smokers, tandoors, fire pits, robata grills and wood-fired ovens. Moreover, the beef is handpicked and dry aged for up to 70 days by the restaurant’s own in-house butchers (there is a Barbecoa butchery downstairs that sells to the public). Barbecoa also boasts of the widest range of American whiskies in the UK and also offers a list of global wines, American and British beers and an assortment of cocktails. Barbecoa is every city slicker’s dream. 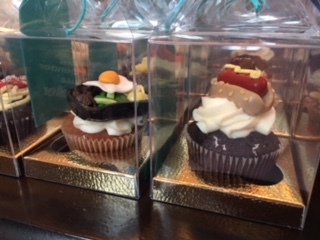 Sleek, well appointed and decidedly modern, the restaurant plays to your appetite with its open kitchen where all the different types of meat, cooking merrily away, are on display and for all to see. But perhaps the most impressive view is that of St Paul’s Cathedral. Barbecoa is perched next to this striking London landmark and offers a perspective like no other – a view that one deserves to enjoy with a cocktail. P chose the Long Islay Iced Tea (£9.50) with Islay Whisky and I went for the Peach Ni-Ti (£10.50) with Matcha-Infused Cucumber Gin, Peach, Lychee, Lemon and Egg White. 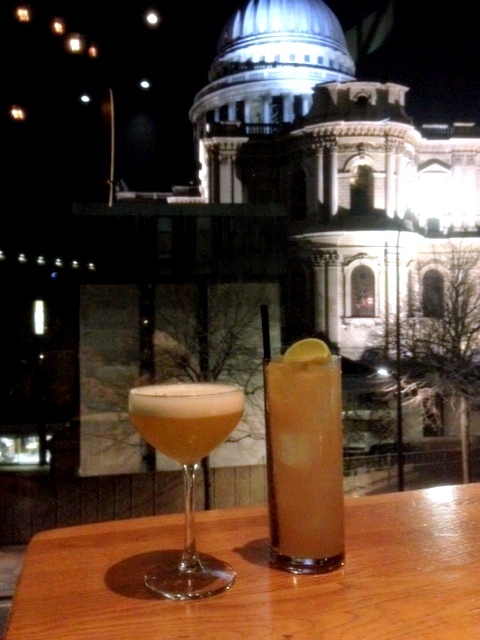 St Paul’s was breathtaking, but the cocktails were less impressive, particularly the Peach Ni-Ti which needed much more acidity to lift it from its borderline blandness. 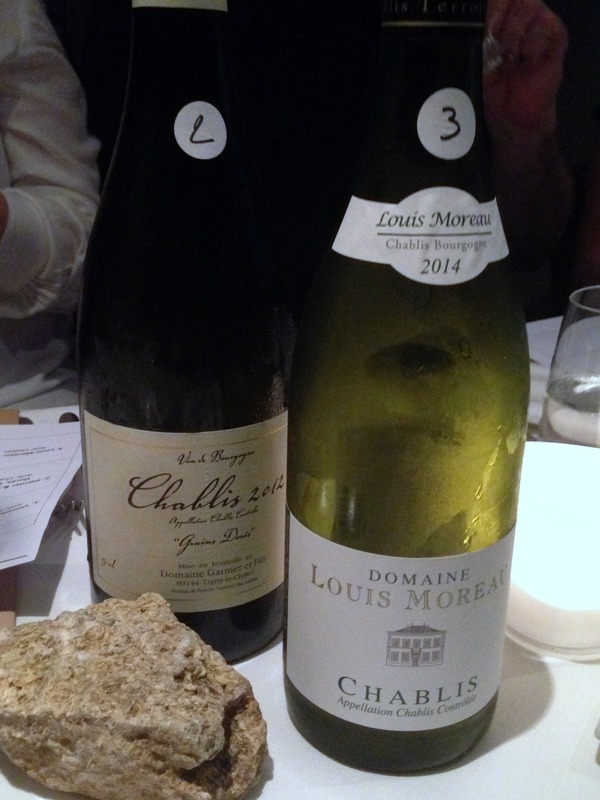 I recently attended a ‘Gastronomy and Geology’ dinner where we went on a journey of discovery into the unique and mineral-laden qualities of the world of Chablis. Chablis is always made from Chardonnay, and what makes it special is that it has its roots in a seam of 155m year old fossilised oyster shells, the same ground that exists in the town of Kimmeridge, Dorset, and runs through parts of Champagne, the Loire valley and of course, Chablis. 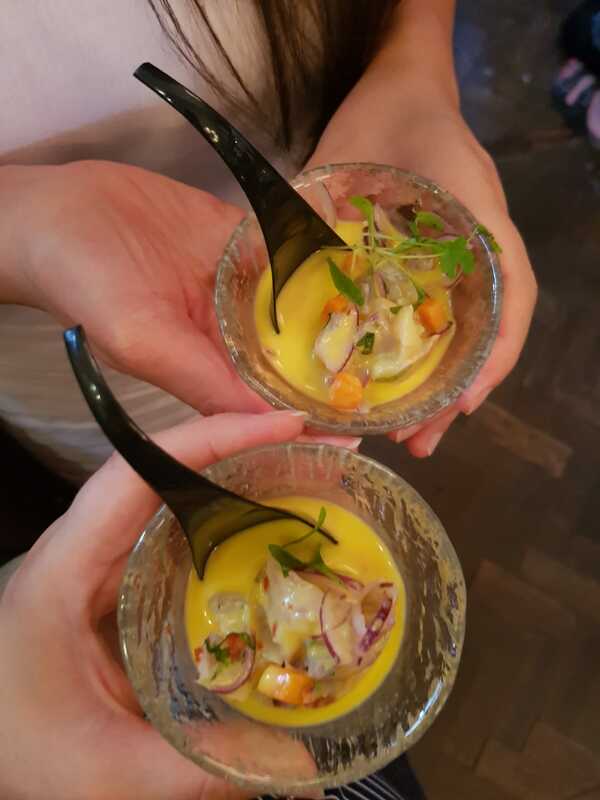 The event was held at The Chancery where we saw an amazing four-course menu prepared by Chef Graham Long being paired with a variety of different quality Chablis wines. The evening began in the Chancery’s cellar bar with crab beignets and truffled cheese arancini canapés accompanied by an accessible Petit Chablis aperitif, a Dauvissat Petit Chablis 2012, which was fresh and clean on the palate. This Chablis is supposedly from an appellation which is the most lowly (Petit Chablis) but it is in fact Petit in name alone. This is because Dauvissat is arguably Chablis’ finest, most manicured domaine. The Fish & Chips Shop by Des McDonald, with locations in Islington and The City, is a posh modern day neighbourhood fish & chip shop that takes pride in serving fresh sustainable fish. Fish and chips takes pride of place as the signature dish, and is cooked using Des McDonald’s own special batter recipe made with Camden beer and served with hand cut chips. But The Fish and Chips Shop doesn’t just serve ‘posh fish and chips’. Instead diners can also select from a range of raw bar items such as rock oysters and Atlantic prawns. 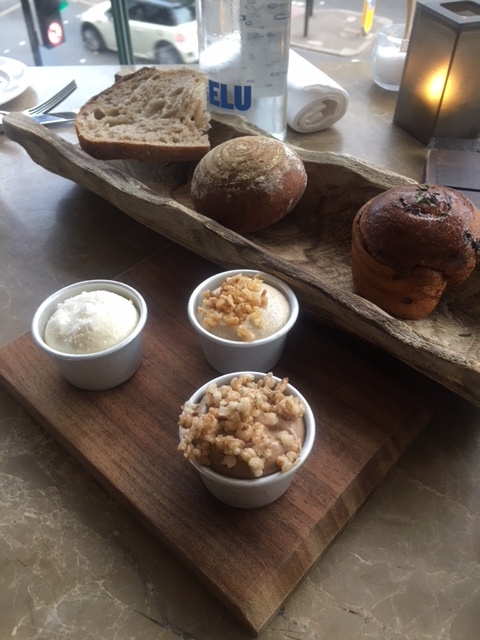 There are also a variety of starters such as crab on toast with spiced avocado, and mains such as Scottish mussels marinière and Cornish monkfish vindaloo. Diners can also chose to have their fish served grilled, steamed or breaded. Des McDonald is a man who knows his food well. Previously a Head Chef at The Ivy, Des later went on to become the group chief executive of Birley Group, Caprice Holdings, and Soho House, before eventually forming his own restaurant group, Des McDonald Restaurants etc. Des is also the restaurateur behind Holborn Dining Room, a restaurant styled in the essence of a grand brasserie. With The Fish & Chips Shop by Des McDonald, the city restaurant resembles a traditional British café, drawing on the use of salvaged timber, duck egg blue panelling and burgundy-glazed tiles. Key to its design is a rectangular bar where one can find a wide range of bottle and draft beers as well as a variety of cocktails. The wine list at The Fish & Chips Shop by Des McDonald features a variety of reds, whites and roses including some of Des McDonald’s own blended wines. 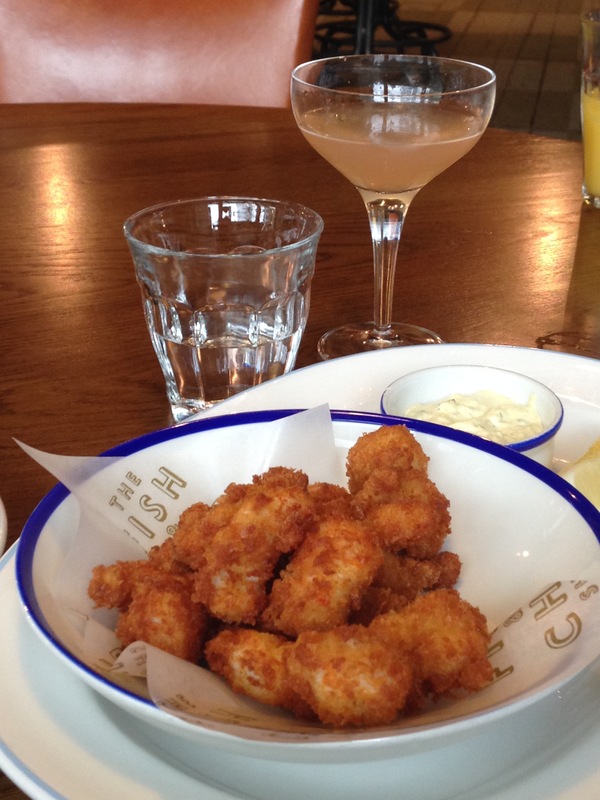 Our first course was the crumbed scampi tails (£11.50) which were wonderfully crunchy, with the coating not only helping to seal in the juiciness of the scampi, but contrasting well with the softness of the flesh. These came with a homemade tartar sauce which was zingy and creamy.